In recent years Dubai has grabbed the headlines with audacious offshore islands, rotating buildings and a seven star hotel. 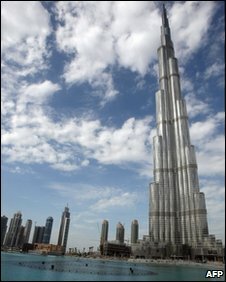 On Monday it opened the world's tallest building, Burj Dubai. At more than 800m, Burj Dubai smashed the previous world record, which was held by Taiwan's 508m Taipei 101. It's about twice the height of the Empire State Building, you can see its spire from 95km away and the exterior is covered in about 26,000 glass panels, which glisten in the midday desert sun. The design of the building posed unprecedented technical and logistical challenges, not just because of its height, but also because Dubai is susceptible to high winds and is close to a geological fault line. "You have the solutions for it but you always wonder how it will really work," Mohamed Ali Alabbar, chairman of Emaar, the developer behind Burj Dubai told the BBC. "We have been hit with lightning twice, there was a big earthquake last year that came across from Iran, and we have had all types of wind which has hit us when we were building. The results have been good and I salute the designers and professionals who helped build it." One of the companies behind the Burj was the Canadian-based wind engineering firm RWDI. Extreme wind speeds on the ground in Dubai can reach 50km an hour. At the top of the building it can be three times as fast. Wayne Boulton, general manager of RWDI's wind engineering team in the Middle East, explains how they tested the building for wind resistance. "We constructed a scale model and put it in a wind tunnel," he says. "In the wind tunnel we are able to test a number of different wind speeds and directions. We can test the pressure you would get on the surface of the building under normal conditions and also under more extreme events." The last couple of decades have seen a shift in the building of skyscrapers from the West to the East. Four out of five of the world's tallest buildings are in Asia and the Middle East. "It comes down to confidence," says Andrew Charlesworth from property consultants Jones Lang LaSalle. "A lot of these emerging economies see themselves as important players in the world and want to show they can deliver these sort of projects. "The wealth of the world is shifting from the West to the East and emerging economies want to highlight their future expectations in terms of where they are gong to be positioning themselves globally." Dubai is a city of superlatives, where everything has to be the biggest and the boldest. But like many of the world's past tallest buildings, Burj Dubai was planned and built during the boom years, and finished during a property crash. The Empire State Building was completed during the Great Depression in the 1930s and the Petronas Towers in Malaysia during the 1990s Asian financial crisis. "As of today we have sold 90% of the building and we expect it to be 90%-occupied," he says. "We were lucky to make more than a 10% return. Originally we thought we'd be lucky to break even, because we can make so much money from the land around Burj Dubai which is a 500-acre site." But for investors, it has been a mixed picture. 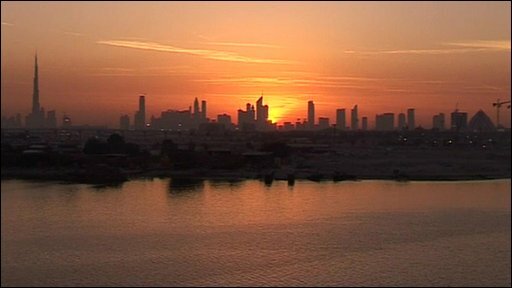 Fortunes have been won and lost on the Dubai property market, which has collapsed in spectacular fashion. Like many properties here, Burj Dubai was sold "off-plan" or before the building was completed. Offices and apartments went on sale in 2004 and most were snapped up by both local and international investors in just two days. Mohamed Abdul Hadi is one local investor who made millions out of Burj Dubai long before the building was completed. "In 2007 we bought three floors on Burj Dubai," he told the BBC. "The first investor paid 2,500 UAE dirhams ($680; £420) per square foot. We bought at AED 3,500 and one year later we sold at around AED 5,000. Look at the profit, where else can you have this but Dubai? And with no taxes." But those who invested late will be nursing large losses, according to Saud Masud, a real estate analyst at Swiss investment bank UBS. "Late stage investors may find this a lot more challenging because property prices in Dubai have come down by 50% and we think prices are likely to go down another 30%," he says. "We have an oversupply in the property market today. We think it will reach 25% to 30% vacancy rates for residential property in a year's time, and for commercial property it's already 40%. Burj Dubai is not immune to that." The landscape of Dubai has changed dramatically over the last two decades. Sheikh Zayed Road is the 12-lane super-highway which runs through the city and is named after the UAE's founding father. Twenty years ago there were just a few tall buildings here, now there are hundreds, all jostling for space. But in the three years that I've been here, the frenzied pace of construction has slowed down and many cranes now stand idle. Developers are holding back on new multi-billion dollar flagship projects and focusing on finishing existing projects instead. About $190bn worth of Dubai real estate projects are currently on hold, according to Middle East Economic Digest. As in many parts of the world, banks are reluctant to lend and investors are reluctant to spend. Burj Dubai could mark the end of an era for skyscrapers in the Gulf - at least in the short term.